Show her your unending love with a diamond eternity band. 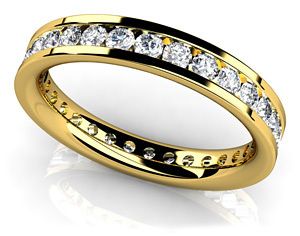 This ring style features a single row of round diamonds and a channel setting. The total diamond weight affects the number of diamonds on the ring. There are 4 total diamond weights to choose from between .60 and 1.61 carat and the number of diamonds on each one vary depending on the ring size. If you need more information about how many diamonds there are on a specific ring size, simply click on the specification sheet icon below. Approx. Metal Weight: 2.70 Gr.